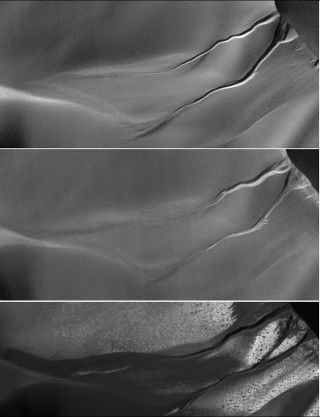 These gullies on a Martian sand dune resemble features on Earth that are carved by water. However, they were likely formed by processes related to the winter buildup of carbon-dioxide frost, according to a new study. The top photo was taken in March 2008 (Martian autumn), the middle one in July 2009 (summer) and the bottom photo in October 2010 (winter). All were taken by NASA's Mars Reconnaissance Orbiter.